Namaste Charter School provides a high-quality education for Kindergartners through eighth graders in the McKinley Park neighborhood and beyond from our school building at 3737 S. Paulina Ave. With a focus on healthy living, Dual Language Immersion in Spanish, and an innovative, data-informed curriculum, Namaste delivers an outstanding option for your child's education. 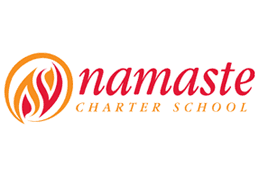 Connect with Namaste via our website at www.namastecharterschool.org, by calling (773) 715-9558 or emailing info@namastecharterschool.org. We also welcome you and yours to attend one of our upcoming events. Namaste Charter School promotes curiosity and lifelong student success by implementing and sharing a holistic educational model. We combine health and wellness with academic rigor in a safe and inclusive environment. Since 2004, Namaste Charter School has been a model for the integration of health and wellness programming in school to ensure students’ lasting physical and social-emotional health parallel to high academic achievement. Namaste was purposefully designed in response to research on learning and promotes equity as a school that educates the whole child. Through high-quality, data-informed, student-centered academics; programming to promote social-emotional growth and creativity; a focus on nutrition, movement, and wellness; family-based programming and authentic engagement; access to a Dual Language Spanish immersion model; and an extended school day and year; Namaste has positioned itself as an innovator in education. Recognizing the alarming increase in childhood obesity rates and the highly detrimental effect poor health has on children’s academic performance, Namaste Charter School was specifically designed to integrate physical fitness, nutrition and healthy lifestyle disciplines with rigorous academic curricula to empower its students for lifelong success. For more information, visit the Namaste Charter School website at https://www.namastecharterschool.org. School Hours: 8:30 a.m. - 4 p.m. Mon.-Thurs., 8:30 a.m. - 1:30 p.m. Fri.; After School Hours 4 p.m. - 5:30 p.m.